The Minnesota GIS/LIS Consortium will hold its 13th annual conference on Geographic Information Systems (GIS) and Land Information Systems (LIS) on October 8-10, 2003. This year's conference will be held in St. Paul, at RiverCentre's Touchstone EnergyR Place. 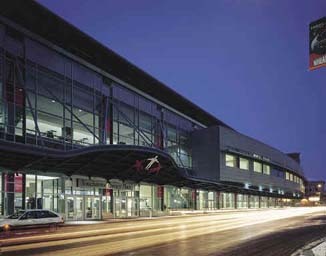 RiverCentre is Saint Paul's state-of-the-art convention, special event, and entertainment complex. Touchstone EnergyR Place, opened in 1998, features views of the Mississippi River and Rice Park. Wednesday (October 8) is, as always, workshop day. Workshops will range from introductory to advanced, lecture style to hands-on, and half to full day. After the workshops there will be a welcome reception. Thursday (October 9) will feature an opening plenary session, followed by concurrent sessions throughout the day. These sessions feature GIS practitioners who will speak on a wide variety of topics. Thursday will feature an awards lunch, as well as a poster display session and vendor reception at the end of the day. Friday (October 10) will provide additional concurrent sessions, as well as additional project and product demonstrations. Friday's lunch will feature a second keynote speaker to close the conference. The exhibit hall will be open on both Thursday and Friday, and will provide an opportunity to see the latest in GIS technology and services.